In the international team, there is a continuous exchange between the German and the American side. Some students from the Cooperative State University Baden-Württemberg Ravensburg (DHBW) have been to Oregon State University (OSU) during their practice phase. Many of the American team members spend a large part of the summer at the Cooperative State University, or at the Formula Student events in Germany and Austria. For the first time four students from DHBW studied abroad at OSU. Corbinian Thelemann (Business Administration and Engineering), Sebastian Thelemann (Vehicle-System-Engineering), Kevin Stahler (Business Administration and Engineering) and Christoph Goering (Mechanical Engineering) have spent their fifth theoretical term from October to December at OSU. GFR: Previously, team members have only stayed at OSU during their practical phases. Why did you decide to spend your fifth Theory Semester there? Corbinian: I have always wanted to study in the United States. After the presentation by the responsible of the ’DHBW International Office’ it was clear that I want to study at OSU. OSU has an excellent reputation concerning engineering sciences. Another reason for me to study at OSU was the cooperation of GFR and the resulting exchange of experience between the American and the German part of the team. Sebastian: On the one hand I wanted to get to know the American university system. On the other hand my seminar paper’s topic was mainly associated with the Subteam Combustion Powertrain. Since the main part of the C-Powertrain activities takes place at the OSU, it seemed to be a good and logical idea to go there. GFR: Did you have an easy, pleasant start? Corbinian: We arrived only a few days before the fall term started, because of an important exam in Germany. After a long flight a team member picked us up from the airport. We directly began to look for an apartment and luckily we were successful. We had a pleasant welcome from the team. GFR: What distinguishes the academic system of the German or especially of the DHBW from the one in the US? Corbinian: Unlike in Germany, there are graded homeworks, weekly tests, “Mid-Term Exams”, and several writing assignments. The preparation and revision of the lectures is also much more time consuming than at DHBW. Sebastian: Moreover, we spent much more time on campus and in the library. That isn’t possible in this way at the DHBW. The “University Life” is much more prevalent on OSU campus than at DHBW. GFR: What have you done for and with the GFR while your time at OSU? Corbinian: Primarily we have written our seminar paper. My task was to analyze last year’s Business Presentation events and to design new concepts for a successful presentation for 2014. In addition, I’ve worked with the American Marketing subteam and always tried to exchange experiences and ideas. Sebastian:I also spent most of my time at GFR with my seminar paper. The typical structure of a seminar paper of OSU restricted me in some ways. It is very specialized on construction designs, while the main part of my work was a simulation. GFR: How was the contact with other team members? Sebastian: The biggest part of the team’s interaction took place at the shop. Most of the team members spend a lot of time there. Besides the work we watched movies or Formula 1 there. There were also barbecues and one time we had a small competition with the mini bike between the break. Corbinian: While spending time at the shop we got to know many of the American team members. Now we can relate a face to the names mentioned in emails and skype calls. This and the fact that we know each other better now are huge advantages. Those aspects strengthen the team spirit and will play an important role for the further corporation. Only if both sides cooperate closely, the long-term success will be saved! GFR : Is there anything the American part of the team can learn from us? Corbinian: A lot of team meetings take place on the American side. This exchange of experiences is important. In my opinion, those meetings don’t accomplish the ultimate goal because of their high frequency and length, though. In Germany the team meetings are shorter, but more structured and target-oriented. Sebastian: Americans have a different way of working than Germans. I got the impression that decisions about solutions for a problem were made too quick sometimes. While Germans tend to overthink different possibilities in every detail, the Americans sometimes work according to the slogan ‘trial and error’. Even though there is no harm meant Americans seem to talk around problems. Opposite to this we Germans like to be direct and speak boldly if something went wrong. According to my opinion problems can be solved quicker if you put the focus on them immediately. GFR: What can we learn from the American side of the team? Both: A big advantage at OSU is that also graduate students participate in the team. These members have much experience and in-depth knowledge. The consistently high level of participation in the workshops on the weekend should establish itself in Germany. GFR: How have you spent your free time? Sebastian: Corvallis is a beautiful and peaceful quiet university town with population of 50,000. More than half of the population are students. 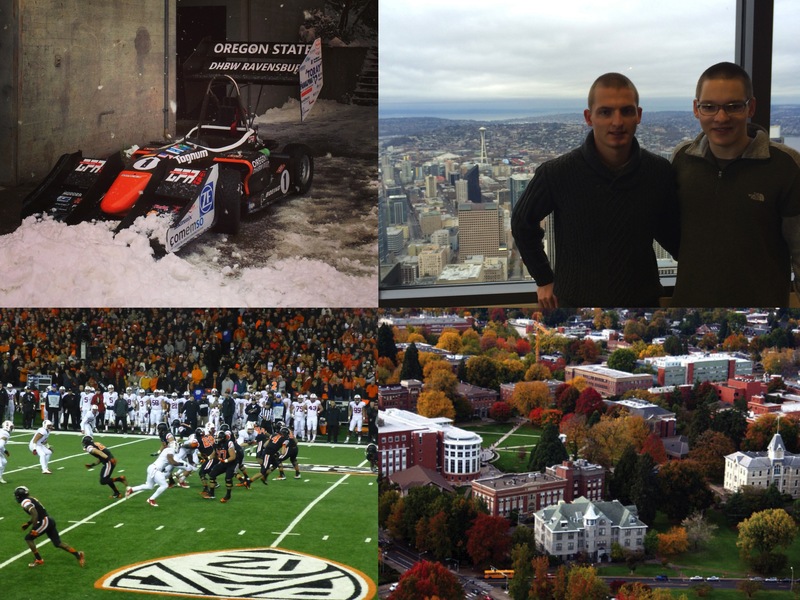 The Oregon State University has greatly contributed to the life and the atmosphere in Corvallis. Highlights included the home games of the OSU football team (The Beavers) which unites the entire city of Corvallis to experience the game and rally for the home team. The larger cities (Portland and Seattle) and the Pacific Coast were also very impressive. But without your own car, you’re stuck there. Corbinian: Furthermore we’ve used the leisure and sports facilities on campus of the OSU. We spent Thanksgiving in an American family and were brought into American culture first hand. GFR: Have developed your personality further while your time at OSU? Corbinian: Through the contacts with many Americans and international students we received a deep insight into other cultures, their habits and gained valuable experiences for the future. Besides that you develop a very good feeling to interact with each other. GFR: Would you do it again? Corbinian: We did so many experiences and made new friends friends that were absolutely worth it. We learned a lot about the culture and language from a different perspective. I highly recommend to spend a term at OSU or to study abroad to everyone who gets the possibility. Sebastian: Definitely. Only abroad you can improve your language skills and get to know other cultures. The American hospitableness and responsive manner has pleased me very much. We would like to thank Corbinian and Sebastian for sharing their experiences with us. The interview was translated in English by GFR.